There’s a saying here in the U.S. when people go on vacation, they leave a sign on their doors that says, Gone Fishin’. Well, that’s what they did in days gone by. I’m not going on vacation, but I’ll be disconnecting from the ‘ole blog for just a bit. The peeps and I have to finish our Blogtionary update. That’s a lot of work! So, while I’m gone, just take a look around the archives and keep yourselves busy. OK? Be back in a while….maybe later next week or so. That’s how long it takes me type sometimes. That blogtionary is getting long and my toenails can only go so fast. 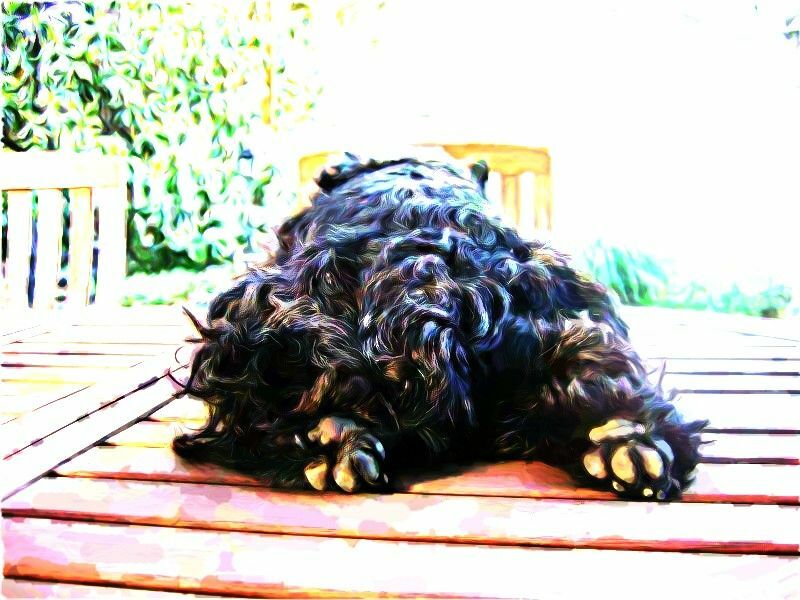 This entry was posted in The Scottie Chronicles and tagged dictionary, fishing, photos of Scotties, Scotties, Scottish Terriers, Stuar the Scottish Terrier, Stuart, The Scottie Chronicles, vacation, watercolor Scottie art. Bookmark the permalink. We’ll miss ya, Stu! Don’t work too hard now, okay? When we went on vacation, the peeps hung a sign “Out to Lunch” over my bed. When we returned, They never removed it. You know that’s not true my Kyla precious pal. Oh good! I was worried about that! OK, will will be here waiting for that update, got your old list by the puter, have fun on vacation Stuart! hurry back, Stuart, I’ll miss you and praying for you and the peeps. Go re-charge the batteries, Stuart, we’ll all be waiting for you. We will miss you and we’ll do the ‘Happy Dance’ when you return! Enjoy! We will be waiting patiently for your return. Mom says dat she loves dis picture. Great perspective. Have fun on your break and don’t work too hard. What an adorable view of you! Good luck Stuart and Mom with getting everything organized! Take time to enjoy! Bless your little heart, Stuart! Don’t let your dad work too hard, you here? Insist that he tale plenty of breaks to walk and play with you. Enjoy the break and good luck with the typing Stu. We’re also taking a little break – mom hasn’t been 100% lately and says she needs a little down time. See you soon my pal, we’ll be here waiting! Miss you much already, Stuart. Have a good rest and keep the peeps in line!